Maple Leaves & Sycamore Trees: Faux Bamboo is Faux Real, Baby! 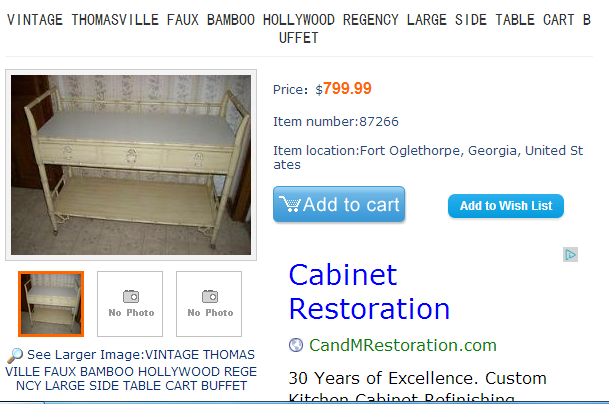 Faux Bamboo is Faux Real, Baby! The other day I posted this picture on MLST's Facebook page. And this beauty is going to serve as their linen closet. It's in perfect condition. Solid. This thing is a beast made by Thomasville back in the day. Faux bamboo, baby. Ha...some spoons fell out when I opened that drawer. And while I'm at it, can I just show you what I found in my little internet search for these pieces? This look is HOT right now. And so are the prices. (well, unless you're me...ha!) 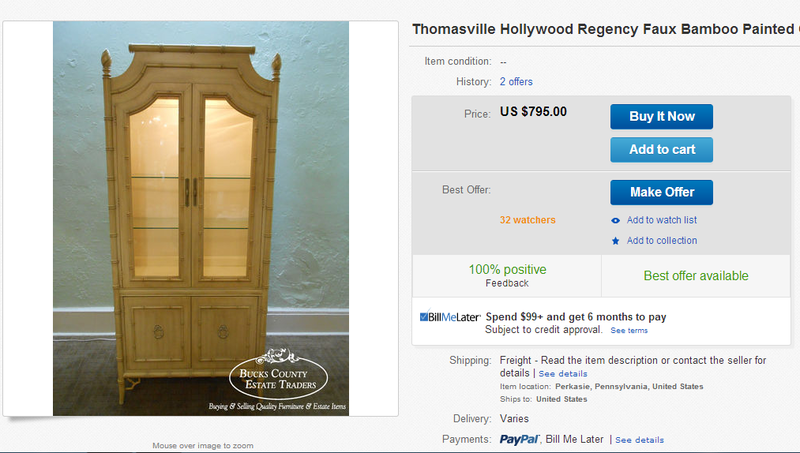 For those who might not be familiar with this particular style, it's called Hollywood Regency. (and here's a great article all about it) Basically, it was in this style that the Hollywood movie stars of the '30s decorated their homes. While I couldn't imagine an entire house outfitted with pieces like these, I do enjoy them mixed in with other styles. That's totally my way of decorating: mixing antiques with modern, vintage with industrial. My mantra is mixing whatever you love! It'll look good if you love it. So I'm pretty stoked right now. I'll be painting the pieces similar to this one (which is a larger-scale version of our china cabinet). Oh and ours has an interior light too...so fun. Just need to get some glass shelves to put inside. And since I'm straight with you guys, I'm gonna tell you how much I bought these for. Ready? I talked the owner down to $60 for both pieces. Yeah. EEK! Can you tell I'm just a bit excited about these projects?! Now we just gotta crackin' on their bathroom! Drool worthy! I have a slight obsession for faux bamboo. I bought a Drexel dresser and had it painted in a piano finish black and there is just no way I would find something like that in solid wood for $300...faux bamboo is gorgeous. It's fabulous! And I love how you always get such a deal! Oh yes. And I love the title of your post.